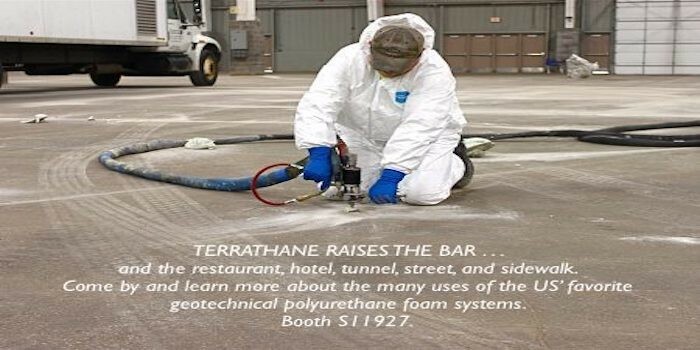 TerraThane is the brand name for a series of polyurethane foam systems formulated for residential and commercial geotechnical uses. TerraThane is an innovative leader in concrete lifting and leveling, foundation repair, infrastructure remediation, erosion control, pipeline trench breaker, or mine reclamation. Since our foams cure in minutes—most solutions exhibit 90% of full compression strength after 15 minutes—large surface areas can be lifted and reopened during application. This allows for swift construction and minimal waste. The ease of application contributes to less time working, as does the fact that many of our geotechnical foam solutions can be applied by a two-man crew. These factors all translate to fewer paid man-hours, and lower overall job costs. Our geotechnical foam solutions are designed to be built up in great lift thickness without scorching or foam splitting. During application, our systems have low exo-therm heat transfer, which eliminates additional spray passes and ensures quick construction. Due to high structural compressive strength providing strong inter-layer adhesion, our solutions ensure a strong monolithic barrier, one that outperforms sand bags. NCFI’s geotechnical foam systems don’t shift and settle afterwards, which means long-term erosion issues are reduced. As the American pioneer of polyurethane foam we’ve developed some of the most used and appreciated foam solutions for industrial, commercial, and geotechnical applications. As industry experts, we offer full field service and support for equipment, application and equipment training, and replacement parts.